With spring well and truly on its way I thought I would take the opportunity to look back over what turned out to be a very busy winter programme. The tasks that we do during the winter period vary quite differently from those that we do at other times of the year. There are several reasons for this that range from biological; we coppice trees when the sap is low and the trees’ energy is stored in its roots, to legal; we must comply with the 1981 Countryside and Wildlife Act that stipulates that hedgelaying must be completed by 1st March. We were fortunate that we did not have a wet a winter as we did in 2013. We have to work sympathetically with our surroundings and by this I mean trying to restrict damage when accessing fields with machinery. Any unavoidable damage to paths and fields, be it by leaving large wheel ruts or disturbing the flow of water off a path means we only create more work for ourselves in repairing where we have been. 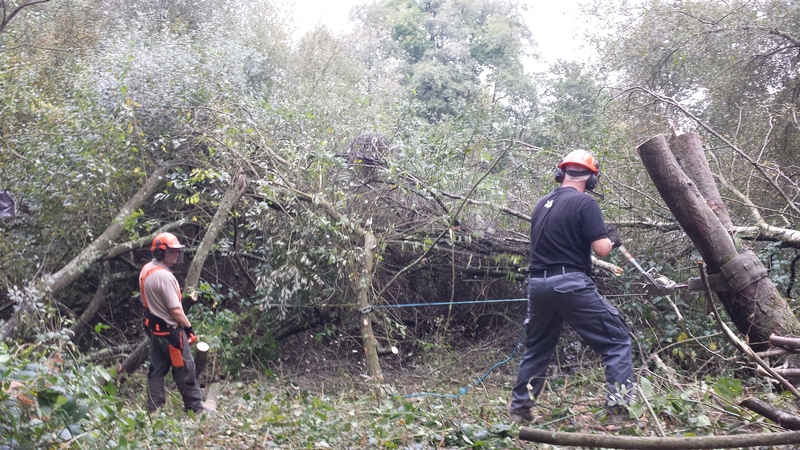 Our winter programme started in early November as we started to coppice a half acre of sweet chestnut woodland. We coppice on a 20 year rotation moving from compartment to compartment within the woods and by doing so we gain multiple benefits. The first is that by having a variety of chestnut at various stages of growth we can attract a differing variety of wildlife; insect life that is attracted by the young new growth through to mature trees that provide shelter and nesting opportunities. Walking through the area recently, I have already noticed the emergence of bluebell growth that is making the most of the improved sunlight hitting the woodland floor. Our trainee ranger, Freya, has just recently obtained her tree felling ticket and this was an excellent area for her to learn her new skills. The coppiced wood will be used for products. Sunlight hitting the woodland floor will encourage plant growth. Early January saw the team hedgelaying on the estate. Personally this is one of my favourite tasks as you can soon change a length of wild looking hawthorn, blackthorn, ash and hazel among others into a wonderfully neat and stockproof natural fence. It might be using the same handtools that hedgelayers have used over the decades that appeals to me in this mechanised world but it is something I do enjoy, though ask me when I’ve been scratched and stabbed by blackthorn and I might not be so enthusiastic! We also ran a couple of hedgelaying courses over the winter, as we do most years, which were well received by those who took part. …was done to a fine standard. As the winter progressed we moved down to the lakes to remove some willow that was starting to encroach from the banks and into the lake. This undertaking was something I covered in detail in an earlier blog should you wish to read about it but with the spring sunshine bouncing off the lake the improved views from different areas of the lake path have made the effort worthwhile. The willows were cut and then winched out of the lake. In February we took a trip down to Smallhythe; a smaller property than Sissinghurst but one that comes under the Sissinghurst portfolio. There is a small garden team based there but they needed extra help in improving the cob nuttery. The hazels desperately needed cutting back to improve fruit production. A team of volunteers descended and the end result was a far tidier nuttery that will hopefully become an attractive and productive part of the garden. The hazels were cut to a four foot length and thinned out. This will hopefully give a good nut production after regrowth. Our final task of the winter was perhaps the one that took the longest. The car park at the front of the property was in need of improvement and our part of the improvements was to put in post and rail and plant a mixture of hedgerow trees. The wood was already cut and our task was to cut the rails and posts to length and then put them in as per the car park plan. With the help of our volunteers the task was completed and when the saplings begin to mature it will be a look an eye-catching area that will provide a fitting start to a visit to Sissinghurst. …out of timber grown on the estate. So it was a busy and exacting winter for us and as spring rolls on we are now turning our attention to what will be an equally busy and exciting summer.